The best part of "making music week" has been rediscovering (or discovering for the first time) some classic children's songs. Trapani writes extended lyrics for classic songs like this one, and then matches them with beautiful illustrations. I've read several of her books, but this is by far my favorite. 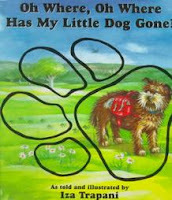 When the little dog is scolded for chewing a shoe, he runs away from home, trying out all sorts of different adventures. Mountain climbing, surfing, the rodeo... none bring him the joy he finds at his own home and at the end of the day, that's where he returns. There are 12 stanzas total which you sing to the classic tune. The illustrations tell more of the story than the lyrics, and they demonstrate a gentle humor that resonates with preschoolers. Little Page loves asking me to read her this book, although I admit I tend to fizzle out at the end and simply read (instead of sing) the the last half! We're going for simple this week. School starts next week (I know, we're the last in the country to start!) and I've been busy getting ready. So when I came across this activity I knew it would be perfect. 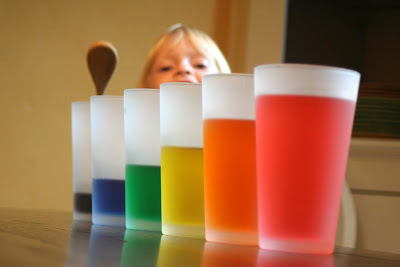 Fill the glasses with different levels of water, then add the food coloring to further differentiate them. We created a rainbow, reviewing the colors we learned during color week. I added the food coloring and Little Page stirred it. When we were finished, Little Page took a wooden spoon and tapped the glasses, listening to the different tones and making her own melodies. I love this idea. So simple...that's what I like about it. You are so talented Cousin! I'm not good at posting. I've really enjoyed your blog. You are gifted :). The girls and I have done a few of the projects. The chalk paint and mustard/ketchup mix were a great hit. We've been using them as teaching tools but with a fun spin. Have you read 'The Princess and the Kiss'--and 'The Squire and the Scroll by Jennie Bishop? I can only imagine that you will find them delightful and full of God's teachings. I was able to get a set of three (there is another called "The Garden Wall")from Christianbook.com. Even adults can enjoy them. Maybe your love of reading has already enlightened you with these gems.